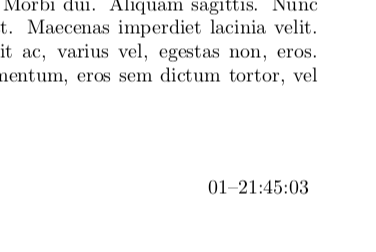 How can I add a time-stamp of the time of compilation of the latex document (day, and clock-time in the form of HH:MM:SS) at the bottom left corner of every page, below the contents of the document? How to get datetime to print “12.34pm”, not “12:34 noon”, at 34 minutes past noon? pgfplots dateplot: automated labels on full hours? how to get the current month in two languages? Is there a time field where I can fill in the time I want? How to redefine the \today with superscript?